Google has boosted the Android management features in Apps to help IT admins control access to the suite from users’ Android smartphones and tablets. “Bring your own device (BYOD) is no longer just a trend—it’s how business gets done,” Clayton Jones, a product manager in Google’s Enterprise unit, wrote in a blog post. 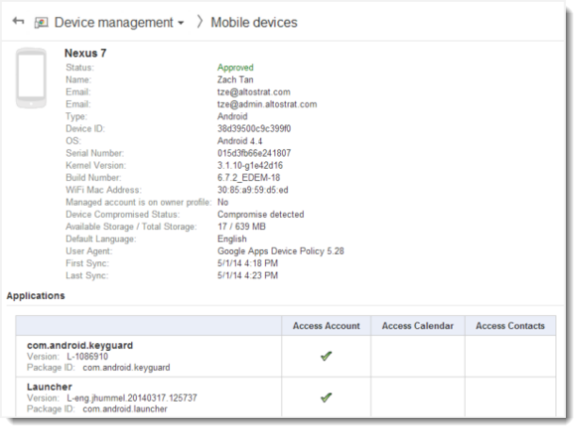 Google Apps Mobile Management for Android, a feature in the suite’s admin console, now can trigger an account wipe on a device that hasn’t been synced with the server for an amount of time predetermined by the IT department. “So a lost device that wasn’t reported or the old device left in a drawer does not cause a security risk,” he wrote Wednesday. Another new feature is support for Wi-Fi networks that use EAP (Extensible Authentication Protocol) for securing access, so admins can configure settings and distribute digital certificates for these networks. Apps Mobile Management for Android will now also flag common signs that indicate a device has been compromised and block it. It will also harvest more information from devices for its reporting fields, including serial number, mobile operator/carrier, Wi-Fi MAC (media access control) address and others. 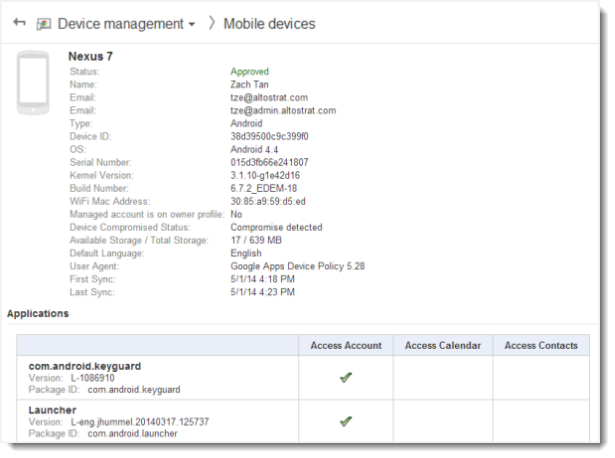 Google Apps Mobile Management is available for the Business, Education and Government editions of the suite. In addition to Android devices, it can be used to manage those running iOS and Windows Phone, as well as smartphones and tablets using Microsoft Exchange ActiveSync, such as BlackBerry 10, according to Google. Google announced the availability of “comprehensive mobile device management” for Apps at no extra charge for Business, Education and Government edition customers in late 2011. Earlier this week, Google also announced that it has improved the options for setting or modifying the length of time—retention period—that a company’s messages are archived in Vault, a fee-based, add on email archiving and e-discovery service for Apps. The options “are now more clear, and we’ve added safeguards when setting a retention period for a specified number of days,” Google said.